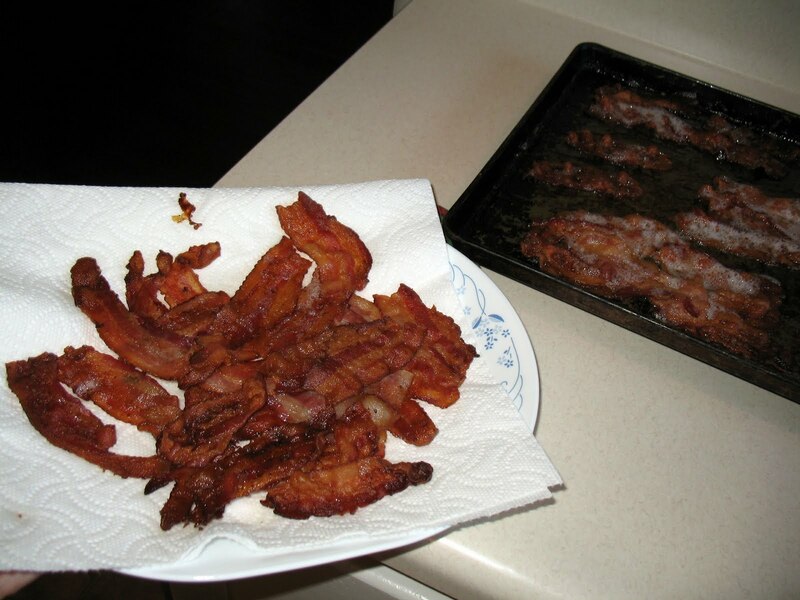 OLD HOUSE HOMESTEAD: Kitchen Tip Tuesday: Yummy Bacon! Kitchen Tip Tuesday: Yummy Bacon! Frying bacon is not on my list of fun things to do. As a matter of fact it's a love-hate relationship between bacon and me. We love to eat it. Some of us more than others. A-hem. But it makes such a mess to fry it. So I decided to start baking it. I love cooking bacon now. Really! Follow these steps and you might just enjoy bacon again. 2. I find that it's easier to handle the cooked bacon for sandwiches, etc. if the strips are smaller than full length. I cut them with my kitchen scissors. 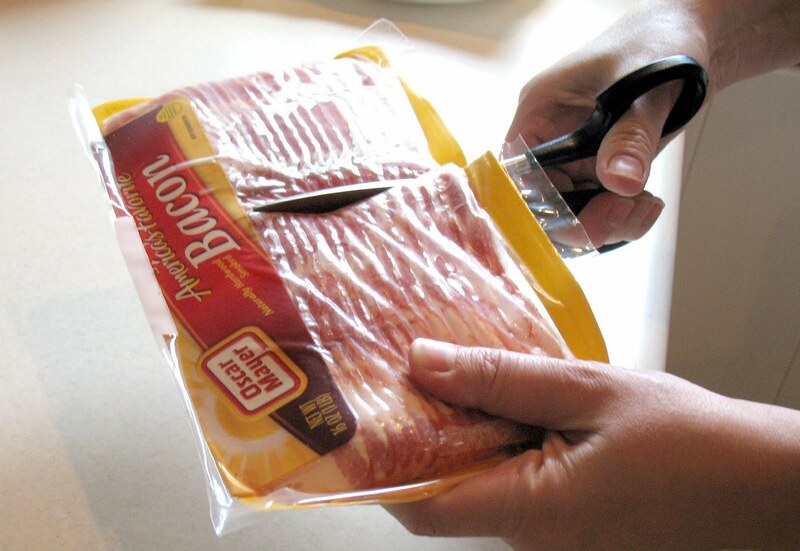 If you buy bacon in the shrink-wrap package this is really easy. Just cut the whole thing in half and then the bacon will slide out of the wrapper. 3. 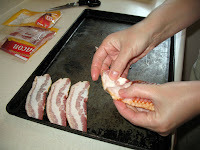 Separate the bacon and lay the strips out on the baking sheet. 4. Bake for about 15-20 minutes until it's the desired crispiness. Be careful removing the baking sheet from the oven...hot grease! 5. Drain the grease into a bowl (pour it into a can that will be thrown away) and remove the bacon from the baking sheet. Place the bacon on a plate with paper towel to soak up extra grease. 6. Enjoy! Either eat it right away or put it in the fridge. I like to bake up several batches at once. I fry my bacon in my electric skillet at about 275- with the lid on. The trick is keeping condesation (that forms in the lid)out; the result is perfect bacon, I love cooking up bacon now too! We cook bacon in the microwave between papertowel on a plate. It takes a fraction of the time and no splattering mess. And the towel soaks up the grease. I used to use an electric skillet until it bit the dust. Yes, the condensation is an issue! Amanda, I do such a large mess of bacon that the oven works best but if I'm in a pinch for a little bit of bacon that's not a bad idea! Does it get crispy in the microwave? We bake bacon too, but we bake it on a rack with a pan under it so fat drips off and that bacon isn't soaking in it as it cooks. I use a cookie cooling rack, but a broiler pan would also work. Thanks for the reminder, Katy! I've used a cooling rack on a baking sheet before, too. Our cooling rack doesn't fit quite right on the cookie sheet so it's a bit of a dangerous circus act to balance it from counter to oven and back again. Maybe I'll have to look for another cooling rack before my next bacon baking day! Thanks for listing my cookbook as one of your picks!! Why, oh why would you not save that delicious bacon grease? Save it in a canning jar in the fridge and add a small dollop to a soup or green beans. It's wonderful, and it is a trick that has been used for generations.